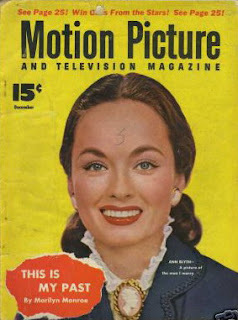 After the screening of Mildred Pierce, Ann Blyth joined Eddie Muller on stage. Her smile was radiant as she received adoring applause. Once it subsided, she started right in on Veda Pierce Forrester. 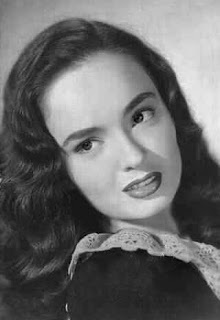 Ann Blyth: Who was that character? [Laughter.] As I've said, I'm glad I don't know anybody like that. I'd forgotten how evil she was. Eddie Muller: I have to ask you, how many times have you seen this movie? Blyth: I haven't seen it really in a long time, certainly not on a big screen. I've only seen parts of it. That's why I'd forgotten so much of the dialogue. I couldn't believe some of it. Muller: Then it's safe for me to say you've never seen this movie with an audience quite like this? Blyth: I don't know when I've enjoyed anything more. Muller: I have so much to ask about Mildred Pierce, but—since this is a noir night—we'll do a flashback. Imagine that we're getting wavy up here and going back to the beginning of the story, Mount Kisco, New York, where you were born. You were, of course, really trained to be an opera singer. Blyth: Yes, indeed, I was born in Mount Kisco and that's, of course, a very prestigious address to have; but, it only happened because my mother was visiting her sister and I decided to make my entrance. That's why I have Mount Kisco as my birthplace; but, I really grew up in the heart of New York on East 49th Street. I only used to visit Mount Kisco. Never did get to live there. But I did get to live in California. That's really good. Muller: Was it your intention to be an opera singer? Blyth: Well, I guess I always loved to sing and—when I was very young—I attached along with a group of other youngsters to the San Carlo Opera Company and that's when my love of opera began. I used to be in Carmen as a street urchin and La Boheme as a little urchin and I actually got to sing. There were a couple of lines that were for youngsters. They do get to sing. I was so terrified of the conductor. I could hardly speak for half of the day because I was so afraid I wouldn't be able to sing; but, of course, that's where my love of opera began. Muller: At a very early age, you ended up on Broadway in Lillian Hellman's Watch On the Rhine? Blyth: That came about in a very interesting way. I was having lunch one day in the cafeteria at a professional children's school in New York. I was sitting off in a corner by myself and I guess I looked like a little orphan, I don't know, but anyway someone came from the principal's office and said, "We'd like you to come to the office" and I thought, "Now what have I done?" So I went to the principal's office and guess who I met there? Lillian Hellman and Herman Shumlin. Of course, I didn't know who they were; but, I was to learn that they were indeed producing a play and looking for children and they were thinking of me for the daughter. So, of course, I went home and told my mother and there was a telephone number for us to call and I was to have an audition. Fortunately, I did get that part. My name was Babette. As a matter of fact, not too many years later when we went on the road, I was signed to a contract, and the studio at one time thought of changing my name Ann to Babette. I thought, "Babette Blyth?" It didn't quite do it. Muller: They did put an "e" on your name early on. Blyth: Both of my names have "e" on them and I think when I was in Watch on the Rhine they left the "e" on the Anne and took it off the Blythe, for whatever reason, who knows? Muller: It was the touring company of that production when you actually were discovered and came to California? Muller: Was your mother protective of you or was she a stage mom? Blyth: My mother was not a stage mom and I enjoyed so much seeing the scenes with dear Butterfly McQueen. She and my mother became quite good friends. She always said in that sweet little voice [imitating Butterfly McQueen]: "Hello, Mrs. Blyth." So dear and she's wonderful in this movie, as are Jack Carson and Eve Arden. Muller: You signed the seven-year contract with Universal and—in the clip reel that Marc so brilliantly assembled that we saw earlier—in your first few roles you were paired with Donald O'Connor. Universal had its own Micky and Judy thing going on here…. Blyth: Except we didn't have a barn. But that's all right. We did okay. Muller: I have to imagine that Donald O'Connor had to be a pretty amusing fellow to work with? Blyth: He was delightful and—as some of you know—he remained a dear friend until he died a few years ago. He was a very special friend. Muller: And I have to ask: did he have an off switch? Because Donald O'Connor always struck me as one of those guys who was constantly funny. Blyth: No, he wasn't—say—like Jerry Lewis, who always seems to be on. Muller: And never constantly funny. Blyth: You said that! I didn't. No, Donald actually he was really at times a very quiet fellow, very quiet. Muller: So you got this contract with Universal for four effervescent light musical comedies [Chip off the Old Block (1944); The Merry Monahans (1944); Babes On Swing Street (1944); and Bowery to Broadway (1944)], how did you come to be cast in Mildred Pierce? Because it's your fifth film. What did they see in you, Ann? Blyth: I had a wonderful agent at that time. He was associated with the Charles Feldman Agency, Al Rockett was his name, and he believed that I had more inside of me and more to put on the screen. He heard about this project and he made sure that I at least got tested for the role because I later learned there were many people—including Shirley Temple—who responded. I didn't learn that until really about 10 years ago. There were many many young actresses who really wanted the part very badly; but I was the lucky one. Muller: Do you remember who some of those were other than Shirley Temple? Blyth: I don't. She would be the only one that I'm sure everyone here would remember. 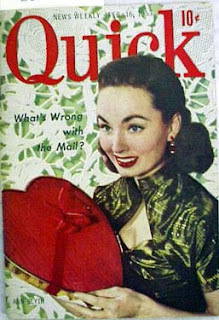 Muller: I'm just wondering, in the book Mildred Pierce Veda wants to be a big opera star. Was there any talk of your background at singing being a factor of why you were up for this part? 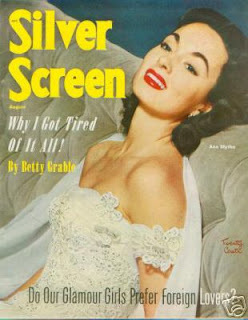 Blyth: I think the fact that I enjoyed singing and that I was able to enjoy that part of my life even when I was making movies—when I would make personal appearances in Los Vegas and at the Coconut Grove in Los Angeles—but opera is an entirely different animal and you have to devote your entire life to the exclusion really of just about anything else. Muller: Just for a bit of trivia, James M. Cain—the author of the novel—his mother was an opera singer so opera goes through all of his stories. So enough of all this, let's talk about Joan! How old were you when you got this part? Blyth: I think I must have been about 16, 17? Muller: So you're 16 years old. Do you recall the day you met Joan? It had to be somewhat atypical. Blyth: I remember the day I met her for the first time because she tested with me. She was kind enough to do that and, of course, I never forgot that because it wasn't really necessary for her to do so. It was just something that she … I think she felt that perhaps there might be some chemistry between the two of us and obviously [husky-throated] there was. I hope I don't have nightmares tonight. I need you there to be there to hold my hand. Muller: Obviously we've all heard the stories about Joan and her personal life and what she happened to bring to the set with her, but what was your experience working with her? Blyth: Starting with testing for the part, I only have good memories of working with her and being around her. Oh, I'm sure there were moments when I wasn't around that might not have been too terrific. One obviously that I had heard about, she and Mike Curtiz used to go round and round about her shoulder pads, in her suits particularly, and he would often say [adopting a thick accent] "Vy can't you get over these GD trollerpads always out to here?!" As you can see, they still were "out to here", so I guess she won that argument. Muller: And of course "GD", if you missed it, stands for "Gosh Darn." How many times—I have to ask this because every time I see this scene I think of this—how many times did you actually get to slap her? Blyth: I'd rather not think about it. Muller: Was that a one-take wonder or did you have to do that several times? Blyth: Actually we didn't have to do it very often because we worked ourselves into such a stage of agitation and fury that—if you didn't do it right the first time—you'd probably go home and come back and do it the next day. Muller: How fascinating is it tonight to see that scene with an audience like this? And be able to know that you actually did that scene on that day with Joan and all these years later … I mean, that is movie history! That's one of the great scenes in the movies! 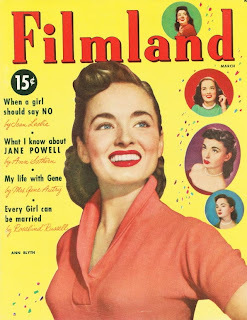 Blyth: I can only tell you the pleasure that it gives me to hear your enjoyment and your pleasure and to tell you that the letters that I still get from all over the world, they still talk about Mildred Pierce. But thank you so much for your wonderful enthusiasm. I do appreciate it. Muller: There are two women in this movie: the one that I would be least likely to ever invite to dinner—Joan—and the one that would be my first choice to invite to dinner, besides you of course, would be Eve Arden. Born in Mill Valley, California. Blyth: She was a delightful person and my husband and I did get to know her a little bit better than most anybody else in that movie. 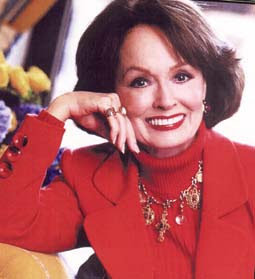 That was because our good friend Gail Patrick Jackson and her husband, we used to have the most wonderful Christmas parties and Eve and her husband would often be there. Of course, she was so different in that place rather than being on the screen. She was really very quiet and a lovely person to be around. Muller: Oh stop. Don't tell us that. Blyth: Just because she could be this sharp-tongued character …. Her delivery was so wonderful, wasn't it? And Jack Carson too. Such wonderful, talented people. Muller: The two best line slingers in the business: Jack Carson and Eve Arden. In my intro I didn't really follow through with what the results of all of this were, right? 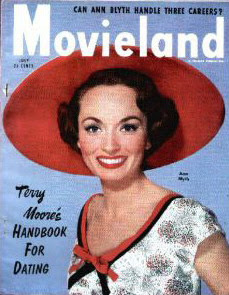 I took us to the making of the film and then it really is like lightning in a bottle because nobody really knew if the public was going to accept Joan Crawford in this new version of herself and, of course, the picture was a huge hit. More than half of the profit that Warner Brothers made that year came from this one movie. It was nominated for eight Academy Awards in which you, of course, were nominated for Best Supporting Actress, along with Eve Arden. Was there any sense when you were making the film—and, as I mentioned, it was Jerry Wald's maiden voyage as a big shot producer at Warner Brothers—was there a sense that you were making something really really special? Blyth: I'm not so sure about that because—going back to another film that Mike Curtiz directed, Casablanca—when they started making that, they really thought it was just going to be a nice little movie. And look what that turned out to be. I'm not so sure that you can always tell if something is going to hit the mark, so to speak, because you never know what an audience is going to like. You just don't. You can have a pretty good sense of what is working as you're doing a project, but to know what an audience is really going to step up and pay to see? That's hard to predict. Muller: Do you remember seeing this film with an audience back then? Did the audience have the same kind of reaction? Blyth: Not like the one I heard tonight. I really can't remember when I saw it for the first time. I remember going to the Academy Awards with my dear mother. 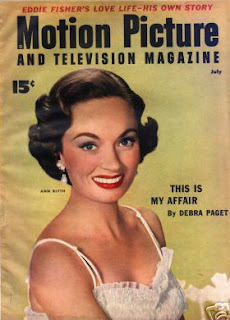 I remember that the studio was kind enough to make a very special gown for me to wear because I had been injured in an accident in the snow—I had been thrown from a toboggan and fractured my back and had to be laid up for quite a while—and when I was able to wear a brace, the studio said, "We'll make a gown for you that will fit over it and nobody will ever know." And they didn't. I was so fortunate that night to share that evening with my dear mother and I shared it also with Joan. I went out to her house to congratulate her and there she was all propped up in bed. I still wonder, you know…. Muller: Let's talk about that. Blyth: I think maybe some of you might have seen the piece that I did for Turner Classic Movies? In which I said, "I think she might have been afraid." Who's to say that maybe she was afraid? Afraid that she wouldn't win. Afraid of the people's reactions if she were at the theater? Who knows? Muller: For those of you who may not be familiar with the story, Joan took to her bed ill and did not show up at the Academy Awards. Hollywood legend has it that she was faking it for whatever reason but, boy, did it make for a good photo op when everybody had to go to Joan's house to take the pictures of her in bed with the Oscar. That was pretty good. You didn't feel at all like…. Muller: I am! You didn't feel at all that Joan was letting down the team? I mean, you and Eve Arden were both nominated…. Blyth: You forget, I was not that far into my career in the movie business so I had a lot to learn myself of what goes on. Muller: Before we move on, I do want to ask you a couple of questions about the director, Michael Curtiz, who I think is probably the most underrated great Hollywood director. Blyth: I agree with you. Muller: In classic Castro fashion, I'm sure this audience could just shout out the titles of their favorite Michael Curtiz movies and it would last for 5-10 minutes. What was he like to work with? Blyth: I just adored him. He was terrific. He was very good to me because—being so young—he coached me along, rather than being a very demanding director. I've had two experiences with him and they were both wonderful. Muller: The Helen Morgan Story is the other one. Blyth: Yes. I had to test for that one too. Muller: True or not: the beach house in Mildred Pierce is actually Michael Curtiz's house? Muller: Am I telling you something new? 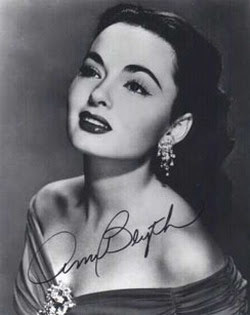 Part Two of Eddie Muller's onstage interview with Ann Blyth can be found here.